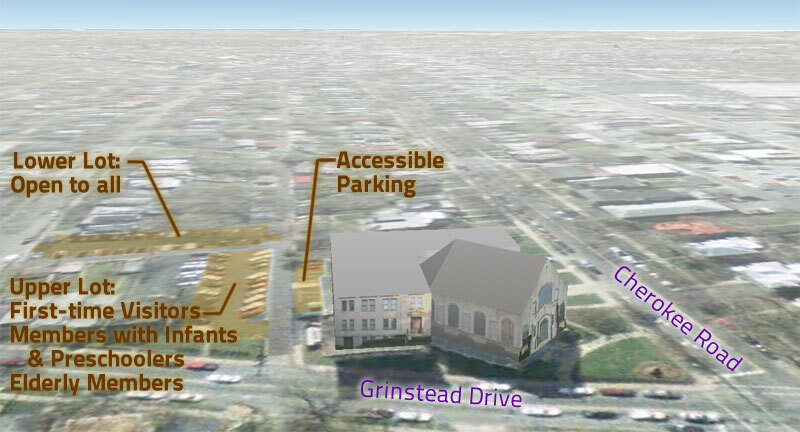 Highland’s on-site parking can be found immediately off Grinstead Drive, using the alley northeast of the church building. The map above designates visitor parking and handicapped parking, as well as parking for our senior drivers or parents with young children. We believe that God’s transforming Love is not limited to the number of our on-campus parking spaces! The following businesses along Bardstown Road and Grinstead Drive have generously offered parking space for our members on Sunday morning from 8:30AM- 12:30PM. Click on the image above for a larger view of the map. Please obtain a Parking Permit Mirror Hanger from the Church Office. Patronize these businesses and say “Thank you”! !